The inaugural season of the United States Football League ended with four teams qualifying for the postseason (three division winners plus a wild card). On July 10, 1983 two of those teams, the Oakland Invaders and Michigan Panthers, met for a Semifinal Playoff game in Pontiac, Michigan. The Panthers, coached by Jim Stanley, had hardly started out looking like a playoff contender as they lost four straight contests after narrowly defeating the Birmingham Stallions in Week 1. 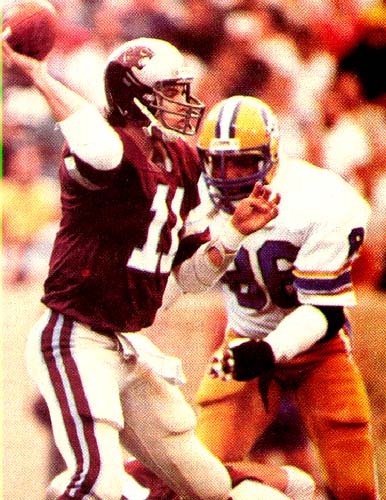 However, veteran talent was brought in to solidify the offensive line and rookie QB Bobby Hebert (pictured above), along with the more-heralded first-year player, WR Anthony Carter out of Michigan, overcame the slow start and began to hit their stride. The defense included the new league’s Defensive Player of the Year, LB John Corker with his 28 sacks, and another star rookie, SS David Greenwood. Michigan caught fire in the second half, winning six consecutive games and 11 of the last 13 to win the Central Division with a 12-6 record and take a great deal of momentum into the postseason. Oakland was the top team in the Pacific Division, but it was the USFL’s weakest grouping and the Invaders had prevailed with a mediocre 9-9 record. Head Coach John Ralston, formerly of Stanford and the Denver Broncos, had gotten good mileage out of two ex-NFL Raiders on offense, TE Raymond Chester and RB Arthur Whittington. He had also uncovered a surprising star in QB Fred Besana, who had been working in a beer distributorship and playing minor league football before signing with the Invaders and leading the league in passing yards (3980), completions (345), and completion percentage (62.7). However, the Invaders had a leaky offensive line and the immobile Besana thus also led the USFL by being sacked 71 times. Inconsistency on defense was also a problem – definitely a concern in facing an explosive team like the Panthers. Furthermore, Whittington would not be starting due to a disciplinary action after missing a practice – the team officially said he was out with a rib injury, and while he came into the game late in the second quarter, his contribution was negligible. A USFL-record crowd of 60,237 was present at the Pontiac Silverdome, helped along by free parking and reduced ticket prices, and it was loud and enthusiastic. Nevertheless, Oakland scored first, driving 78 yards in 14 plays that ate up over seven minutes of the first quarter. But after getting a first down at the Michigan two yard line, it took four plays for the Invaders to get into the end zone, with Besana finally sneaking for the last yard on fourth down. Behind 7-0, the Panthers responded impressively on the next series that stretched into the second quarter as Hebert threw to WR Derek Holloway for a 40-yard gain and RB John Williams ran for a five-yard touchdown. The defense then set up another score when LB Kyle Borland intercepted a Besana pass and the resulting Michigan possession led to a 38-yard field goal by Novo Bojovic. With the Invaders unable to move the ball effectively against the inspired Michigan defense, the Panthers decided to press their advantage in extending the lead late in the second quarter. In a key gamble, they passed up an easy field goal attempt on fourth down with 11 seconds left in the half and Hebert passed to Carter for a three-yard touchdown that made it a 17-7 contest at the midway point. Oakland wasn’t out of it yet and on the third play of the second half, LB David Shaw picked off a swing pass by Hebert and ran 19 yards for a touchdown that, with the successful extra point, narrowed Michigan’s lead to 17-14. The Panthers once again responded by scoring, putting together an 11-play, 80-yard drive that culminated in Hebert keeping the ball himself for a one-yard TD. It was 24-14 with just under ten minutes remaining in the third quarter. Late in the period, Michigan LB Ray Bentley forced Oakland RB Ted Torosian to fumble and DE Allen Hughes recovered for the Panthers at the Michigan 17. On the ensuing series, the biggest play was a Hebert-to-Carter pass that covered 56 yards. Shortly thereafter, RB Ken Lacy scored on an 18-yard run and the home team was up by 31-14 and firmly in control. That was it for the scoring until RB Cleo Miller ran for a touchdown from three yards out for the Panthers with a little under two minutes remaining (the extra point attempt failed). Oakland responded with a consolation five-yard scoring pass from Besana to WR Marc Lewis. Following Oakland’s final touchdown, fans overflowed the field with 25 seconds on the clock and tore down the goal posts. The teams and officials headed to the locker rooms and the game was officially declared complete at 14:35 of the final period. The Panthers came away with a decisive 37-21 win. Michigan showed a great deal of flair, using laterals and reverses and twice passing up field goal attempts on fourth down to successfully go for touchdowns. While the Invaders held only a narrow edge in first downs (22 to 20), they rolled up significantly more yardage (463 to 321) and held the ball over six minutes longer (32:58 to 26:37). Oakland was further handicapped by turning the ball over four times, against two suffered by the Panthers. Bobby Hebert completed 18 of 27 passes for 295 yards with one touchdown and interception apiece. Anthony Carter (pictured at right) caught three passes for 78 yards and a TD and Derek Holloway also had three receptions, for 78 yards. TE Mike Cobb contributed three more for 25 yards. However, the team’s leading receiver was RB Ken Lacy, who had 4 catches for 30 yards to go along with his 73 yards on 14 rushing attempts. John Williams compiled 59 yards on his 17 carries. Ray Bentley had a notable game on defense for the Panthers, forcing two fumbles and recovering one. Fred Besana, playing catch-up for most of the game, went to the air 35 times and completed 23 for 258 yards with the one late touchdown and had two picked off. WR Gordon Banks caught 7 of those throws for 96 yards. Ted Torosian gained just 18 yards on 10 carries that included a fumble and pulled in 7 pass receptions for 46 yards. Of Oakland’s total of 64 yards on the ground, 43 came on two carries by Marc Lewis. The Panthers kept up the momentum, defeating the Philadelphia Stars in the USFL Championship game. Their 1984 season was the mirror opposite of ‘83 as Michigan ran out to a 6-0 start but, thanks to key injuries to Anthony Carter and David Greenwood, slumped in the second half and nosed into the postseason as a wild card team with a 10-8 record. Oakland lost its first nine contests of ’84, turned around and won seven straight, and finished at 7-11.